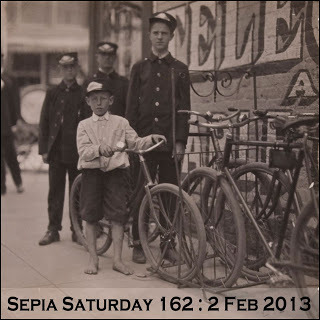 Through my post last Wednesday, a commenter introduced me to Sepia Saturday. Every week they post an old photograph, and participants are supposed to use it as a prompt and reflect upon an old photograph (or photographs) from their collection that in some way correspond(s) to a theme associated with the original. I like the challenge of finding a photographic companion to their prompt. I can see that I am occasionally going to have to get a bit creative. At least they give previews for the following two weeks, which gives some time to allow the creative juices to flow. I know one question in some reader's mind: Wait, it isn't Saturday yet! I am posting this at midnight GMT. While it is six hours earlier where I am, the host of Sepia Saturday and several participants are "across the pond." Several participants are likely to have jumped in even earlier. Even though I posted on Wednesday last week, I was still the sixth participant. This is a photograph of my maternal grandfather, Martin Deutsch, from 1972, when he was 65. I was 3 years old at the time, so while I've seen pictures, I never knew him as a younger man. That's the way it is with grandfathers. However, he was very active. Not only did he ride bicycles, he lifted weights, bowled, jogged in circles around his basement, and in the winter shoveled snow. Here's a photograph of him from 1942, during his war service. He was stationed in the Middle East and Africa. A jeep isn't too much different from a bicycle. Both are 'open air' modes of transport. Different number of wheels. In both of my photographs, there are trees, and grass. Something noticeably absent from the prompt. The jeep photo makes war look like a fun trip to the country. 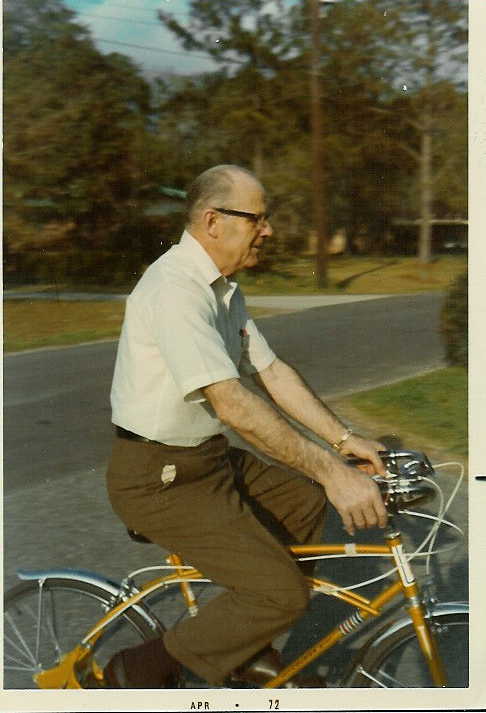 I never saw my grandfathers on bicycles, but one of them faithfully ran alongside as I learned to steady myself on my first bike. Your grandfather was definitely more active than either one of mine as I knew them. Shovelling snow is on of my roles at 75. I get to shovel up other things wne I visit my daughter's four dogs.However I haven't ridden a bike since the 1960s. I had several rides in various jeeps when in the army and stationed in France with the Americans. I find it difficult to picture my grandpa's on a bike or in a jeep for that matter. There don't appear to be any blogging police peering over our shoulders. It's great that you have such informal photos of your grandfather. What treasures. What a great post! Wonderful photos, and yes Alan is wonderful and he puts up the call on Tuesday as a rule and we can post any time after that- I being in America and in the beginning thought it had to be Saturday and so I pretty much post on Saturday- but also, he's been putting advance photos up so you can work ahead and get things lines up and ready! Isn't that just a cool way to do it! Peter is right, there are no rules. But we do love creativity and this means that we will all love your posts. One of the great things about pictures of your grandfather at different ages is that it allows you a peek into his past and youth (well, 35 is younger than 65). I really liked that sense of a sure young man in his jeep. 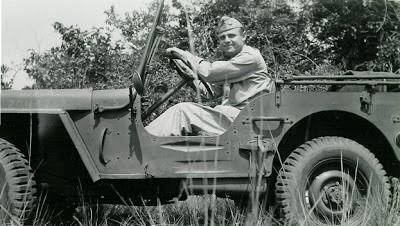 when I saw the photo of your grandfather in the jeep I thought it was William Holden in one of his military films. He has exactly the same posture and look about him. I guess he could have been a star! Welcome to Sepia Saturday where there are no rules.